When you create an AIC in Archivematica, the individual AIPs are not physically combined; that is, they still exist as separate packages. The AIC itself is also a separate package, containing only metadata - specifically, a specialized METS file that lists all of the AIPs that belong to the AIC. Creating an AIC is a two-step process. First, you must create your AIPs. It’s easiest if you are able to create all of the required AIPs before you create the AIC, but there is information below on how to update an AIC if needed. The method below adds some metadata about the AIC (an identifier) to each transfer before it becomes an AIP. This is optional, but it can be a helpful way to search for the AIPs that will form the AIC. If you do not use the AIC identifier, you must use some other method by which you can search for the AIPs that will be included in the AIC (i.e. the AIP name). Note that if you do not add an AIC identifier, it may be more difficult to search for the AIC’s component AIPs later. The second step uses the AIC identifier (or some other search parameter) to connect multiple AIPs into an AIC. The method described requires users to enter the AIC identifier manually while processing the transfer; however, it is also possible to add the AIC identifier using a metadata CSV by adding a column to your CSV with the heading dcterms.isPartOf. Create a transfer. This transfer can consist of any data and may be created using any transfer type. If you’d like, add an AIC identifier to the transfer by clicking on the transfer’s metadata button. This must be done before Microservice: Add final metadata. 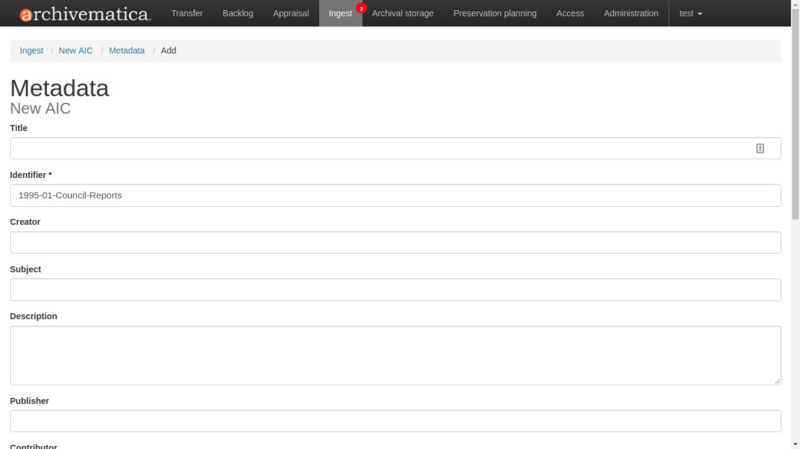 Archivematica can be configured to remind you to add metadata. In your processing configuration, set the field Reminder: add metadata if desired to None. Clicking on the metadata button should have opened up the transfer’s metadata information screen. Under the Metadata heading, click on Add. In the Part of AIC field, enter the AIC identifier. You can also add other descriptive metadata for the transfer, if you wish. The AIC identifier can be any combination of letters and numbers. At bottom of screen, click Create. Finish processing your AIP and place it in storage. Repeat steps 1 through 6 to create as many AIPs as you need. If you plan to use the AIC identifier to connect your AIPs, make sure to enter the same number in the Part of AIC field. Once you’ve created all your AIPs, move on to Step 2 and create the AIC. Once all your AIPs have been stored, click on the Archival Storage tab. Search for the AIPs that will be included in the AIC. This is where the AIC identifier is helpful. To retrieve all AIPs with the same value in Part of AIC, enter AIC#[identifier] in the search box, replacing [identifier] with the identifier you entered. Select Part of AIC as the search parameter. When you’re satisfied that only the AIPs that you want to include in the AIC are included in the search results, click Create an AIC. You will see a metadata entry template for the AIC. At a minimum, you must give the AIC an identifier. 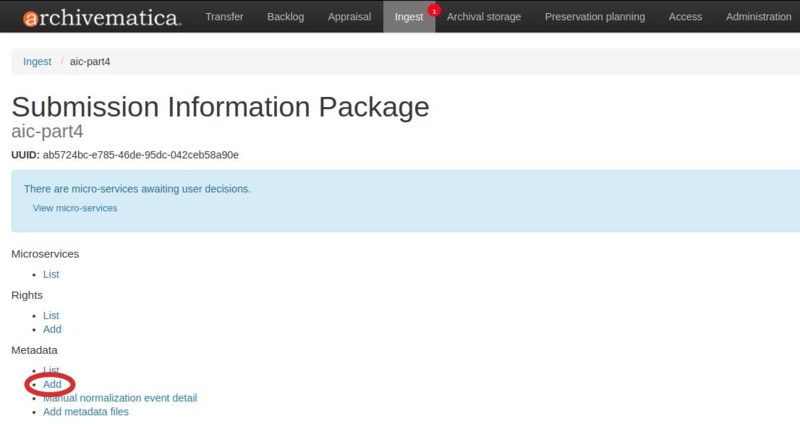 Archivematica will use the identifier as the name of the AIC package that it is about to generate. You can also add more metadata about the AIC using this form, if you wish. When you’re done, click on Create at the bottom of the metadata entry template. Navigate to the Ingest tab. The AIC will appear as a new ingest. Approve it. 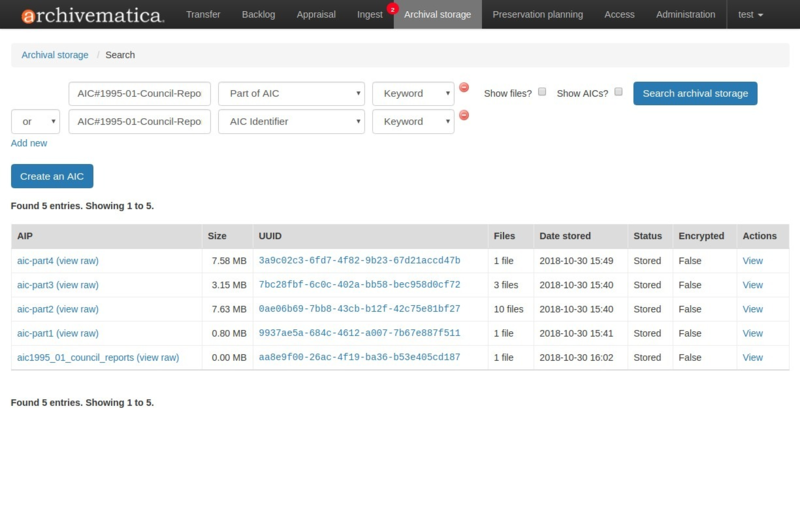 If you need to retrieve the AIC or any of the AIPs that make up the AIC, you can do so on the Archival Storage tab. To see AIC information while browsing the Archival Storage tab, check the Show AICs? button next to the search button. Search results will now include the column AIC, which provides information about whether or not the AIP is included in an AIC (or if it is, itself, an AIC). In the above screenshot, note that four of the AIPs are part of an AIC while the last result is the AIC itself. This was a wildcard search, displaying everything currently in Archival Storage. To search for the AIPs that belong to a specific AIC, enter AIC#[identifier] in the search box, replacing [identifier] with the identifier that you entered while creating the AIPs (see Step 1, above). Select Part of AIC as the search parameter. If you did not create your AIC by adding the AIC identifier to each AIP, as described in Step 1 above, it may be more difficult to find the AIC’s component AIPs. You may need to download the AIC package and review the METS file contained within to see which AIPs make up the AIC. You can search for a specific AIC by using the AIC identifier. Enter AIC#[identifier] in the search box, replacing [identifier] with the identifier for your AIC. Select AIC identifier as the search parameter. If you want to see both the AIC and the AIPs that belong to it, you can perform a Boolean search. Search for the AIPs by entering AIC#[identifier] in the search box, replacing [identifier] with the identifier that you entered while creating the AIPs. Select Part of AIC as the search parameter. Change the boolean operator to OR. In the second query line, enter AIC#[identifier] in the search box, replacing [identifier] with the identifier for your AIC. Select AIC identifier as the search parameter. The most common reason to update an AIC is to add more AIPs to it. To do this, the original AIC must be deleted and a new AIC created. An AIC is deleted the same way that an AIP is deleted. For more information on deleting an AIP, see Delete an AIP. To create a new AIC, follow the instructions to create an AIC above. Like AIPs, AICs are bagged according to the BagIt specification. 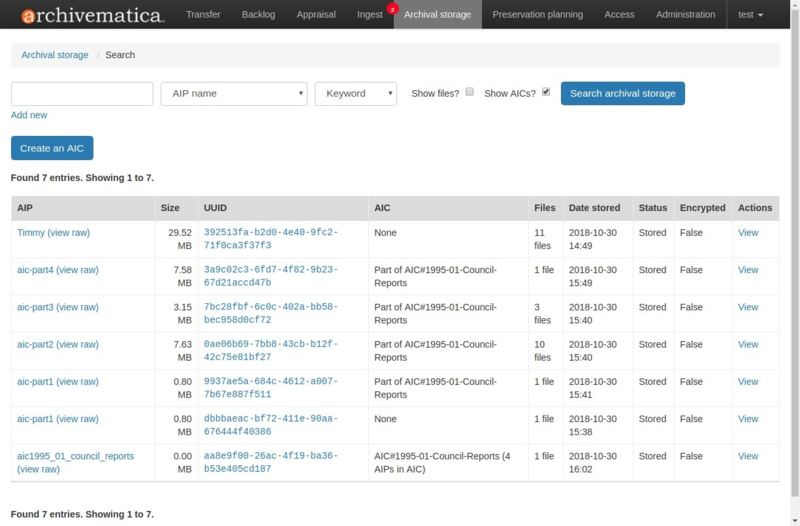 To learn more about how Archivematica implements BagIt, see AIP structure. There are two METS files included in the AIC. The first one, in the data subdirectory, is the METS file for the AIC package itself, similar to an AIP METS file. The second METS file, located within data/metadata, contains information about the AIC and its component AIPs. The AIC’s descriptive metadata section (dmdSec) includes the Dublin Core added during AIC creation. The METS file also shows which AIPs are included in this AIC. The AIC’s component AIPs are listed in the METS file’s fileSec. This information is also displayed in the logical structMap of the METS. The logical structMap is a hierarchical display of the AIC, intended to show the relationship between the items being described (i.e. that the component AIPs are part of this AIC).